C12 church of 2 phases, of which the tower is the later. Restored 1858 by Sir Arthur Blomfield. MATERIALS: Local rubble sandstone, except for squared blocks in the rebuilt east chancel wall, with freestone dressings, tile roofs. PLAN: Nave, lower and narrower chancel, west tower. EXTERIOR: A Norman church retaining much of its original character and without later extension. The Norman south doorway, possibly repositioned when the tower was built, has simple imposts and a tympanum made up of bands of chevrons. The studded door has strap hinges. The blocked north doorway is similar, but its weathered tympanum shows a full-length demon emitting stylised branches. Straight-headed 2-light C19 windows are in the nave, two in the south wall, one in the north. The 2-stage Norman tower has pilaster buttresses in the lower stage, and a battered plinth. It has small round-headed north and south windows, and straight-headed west window (although it retains its original round-headed rere-arch). At the bell stage are fields recessed beneath corbel tables in the west, north and south faces. Twin bell openings have a central column with block capital. The pyramidal roof, with weathervane, are C19 and mentioned in 1855. The chancel has 2 small Norman windows in the chancel south and north walls The 3 round-headed windows under a linked hood mould in the east wall are of 1858. The east end of the nave is strengthened by tie-bolts with a large plate in the north wall. INTERIOR: The single-stepped tower arch has semi-circular responds, and capitals incorporating volutes and beaded ornamental bands that show the influence of the Herefordshire school of Romanesque sculpture. The earlier chancel arch is plain, on simple imposts. The chancel east window has shafted rere arches with scalloped capitals. In the nave is a boarded barrel ceiling with thin ribs, on a moulded cornice. The chancel has a canted ceiling on a moulded cornice, with thin ribs, foliage bosses over the sanctuary, and boarded behind. In the south wall is a round-headed piscina of 1858. Walls are plastered. There are C19 tile floors throughout, with encaustic tiles in the sanctuary by Maw & Co. PRINCIPAL FIXTURES: The round Norman tub font, similar to Morville and influenced by the Herefordshire school, has cable-moulding around the rim, and medallions which, on the north side, emerge from the mouths of demonic masks. Pews and choir stalls of 1858 have shaped ends and open backs. The polygonal wooden pulpit, brought from Monkhopton in 1948, has an open arcaded front. The chancel has a panelled dado made up in 1858 from former pews, and altar triptych of cross and angels painted on board, by Harry Burrows, c1870. In the east nave wall are metal commandment boards. Nave and chancel have iron branch candlesticks of 1862. There is a hatchment of Richard Lacon (d 1803) in the north nave wall. In the blocked north doorway is a grave slab of Francis Anderton (d 1779) and George Johnson (d 1803), Catholic monks of Douai who died during missionary work in England. The Resurrection in the east window is by William Warrington, 1862. 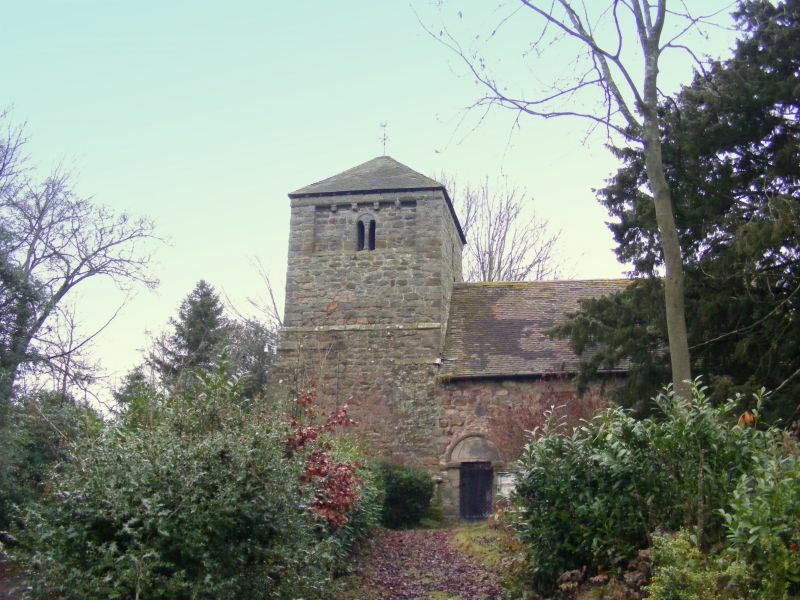 HISTORY: Linley church was built in the C12 as a chapel of Much Wenlock. A tower was added in the late C12. The church was restored in 1858 by (Sir) Arthur Blomfield (1829-99), who had just set up his own practice. He enlarged the nave windows, rebuilt the east wall with new window, and installed new benches. The church is no longer open for regular worship. SOURCES: D.C. Cox, Sir Stephen Glynne's Church Notes for Shropshire, 1997, p 59. J. Newman and N. Pevsner, The Buildings of England: Shropshire, 2006, pp 331-32. VCH Shropshire, x, pp 353-54. *	It is a near-complete C12 church, including a fine tower, with comparatively little later alteration. *	It retains Norman architectural features of importance, including two tympana and the tower arch.